I hope people will forgive me if this rambles as while a certain writer can't figure out ways to get more sleep, the NYR and the NYI prospects are still playing from Sweden to Prince George. On Sunday, 7 New York Ranger and New York Islander prospects hit the ice with mixed results. Anthony Duclair (NYR 2013 3rd) leads us off again as one of my friends said he had to have had an off-day with just a 1-1-2 performance as his Quebec Remparts lost via the shootout 3-2 to the Rimouski Oceanic. Seriously it is so very hard to avoid using cliches when you are trying to describe a prospect who is scoring at will but that is what is happening with Duclair. 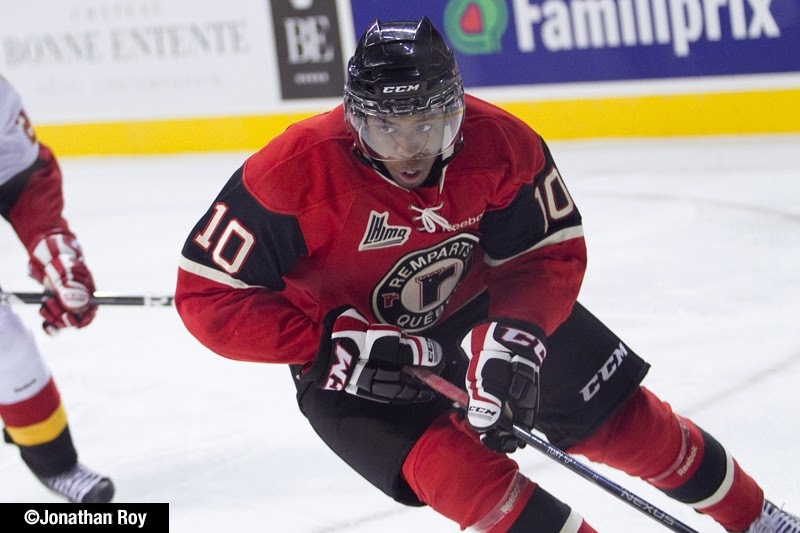 You know the story for the Remparts as there was Anthony Duclair once again setting up the first Quebec goal as Kurt Etchegary's 10th goal at 7:46 of the 2nd period tying up the game at 2-2. Etchegary has goals in his last 4 games and guess who has an assist on each one. For Duclair it was his 26th helper on the season. In the 3rd period with Quebec trailing 2-1, on the power player with just 10 seconds remaining in regulation, there was Duclair beating Rimouki's Zachary Fortin for the goal at 19:50 to force overtime and then the shootout. Let us hit it for the 3rd best scorer in the OHL with the 41-26-57. Duclair tied his single season for goals after he had scored his 31st goal of the season. Duclair had 31 goals in the 2011-2012 season which for Duclair was 63 games. This season, it has taken Duclair all of 37 games to reach 31. Duclair even scored on his shootout attempt which was his 1st make after 5 tries this season. Loic Ledec (NYI 2012 4th) was playing in his 2nd game after the trade to Rimouski and did not play badly even if he did't score. Leduc registered 4 hits on the game for his Oceanice and if you can't accept those kind of numbers them sorry not much will please you. For Ryan Graves (NYR 2012 4th) and his Charlottetown Islanders, Sunday's game against the Acadie-Bathurst Titans was payback time from the Titan. Saturday evening it was Islanders with the 4-0 win. Sunday night the tides were 100% turned as the Titan shut the Islanders 4-0. Graves was of course svery scoreless with a -3 on 1 shot. Brady Skjei (NYR 2012 1st) was scoreless and a +2 as the USA team gets to sit and wait for Canada on New Year's Eve. Skjei plays defense and one of these days somone is going to come up with a working stat that allows a defensive player to get rightful credit for his game when he doesn't score a ton of points. Jesse Graham (NYI 2012 6th) had an up and down game as his Saginaw Spririt dropped their 5th straight game 6-5 to the Windsor Spitfires. The Spririt have only themselves to blame here as their undisciplined play led to 3 power play goals and 1 shorthanded goal scored against them in this game. Graham had an assist for his 29th point of the season but Graham also took a slashing call with his team up 3-2 and Windsor scored to tie the game up. Troy Donnay (NYR 2013 UFA) and his Erie Otters are a bit of a mess with 4 key players playing in Sweden as well as 1 more playing for the Under-17 tournament. The Otters were defeated by the Guelph Storm 5-2 on Sunday as Donnay was scoreless and a minor for roughing. Victor Crus-Rydberg (NYI 2013 5th) was scoreless as his Plymouth Whalers defeated the London Knights 2-1 thanks to the shootout round.